California’s recreational marijuana program is set to launch Jan. 1, and lawmakers have laid the regulatory foundation to govern the new industry at the state level. 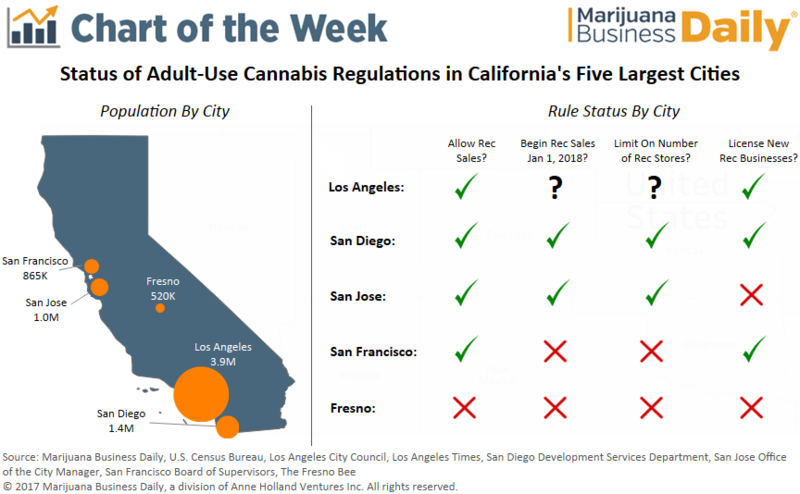 But at the local level – where municipalities can further regulate or even outright ban marijuana businesses – California’s largest cities are in varying stages of the rulemaking process. California is implementing a dual-licensing system between state and local governments, meaning cannabis businesses will be required to obtain some sort of local authorization from the city and/or the county in which they’ll operate before they can apply for a state license. Therefore, both state and local regulations need to be in place before adult-use sales can begin. And the stakes are high, as The Golden State is expected to generate $4.5 billion-$5 billion in annual adult-use cannabis sales within a few years of the program’s launch, according to Marijuana Business Daily estimates. • Los Angeles: The City Council passed a lengthy and complex package of proposed rules to govern the licensing and operations of marijuana businesses in October, moving it over to the city’s lawyers who are currently drafting the legal language to implement the proposed regulations. Among many other issues, the draft ordinance proposes a social equity program and attempts to address the many “gray market” operators in the city without disrupting the medical supply chain or giving advantages to those that have been operating in violation of the law. The council may take further action on the regulations this week, but it’s unclear whether final rules will be in place by Jan. 1. 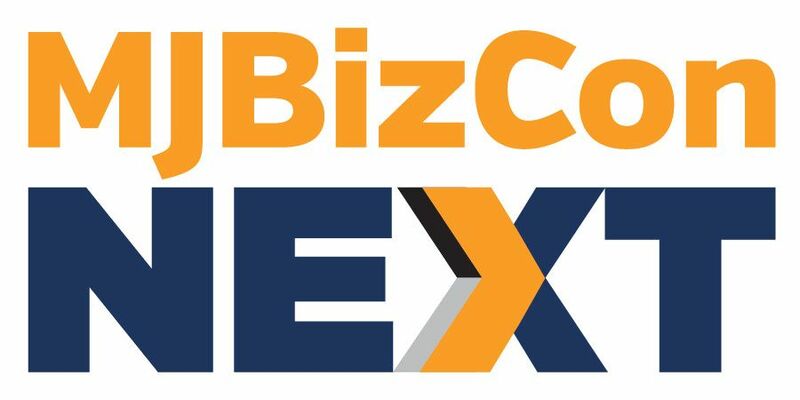 • San Diego: In an effort to create a legal, local supply chain, the City Council agreed to license all types of marijuana businesses in the city, including retailers, cultivators, infused product manufacturers and testing labs. A maximum of 40 marijuana production facilities (businesses that grow and/or process marijuana) and 36 retailers will be allowed in the city. The approximately 17 existing dispensaries in San Diego will be allowed to sell to rec customers once adult-use sales begin on Jan. 1. • San Jose: In a unanimous decision, the City Council passed an ordinance to allow the city’s 16 medical dispensaries to sell to the rec market at the start of the new year. However, no other types of cannabis businesses are allowed, and no new applications for dispensaries/rec stores are being accepted at this time. • San Francisco: The City Council passed rules in late November to govern adult-use cannabis businesses, finally reaching an agreement over a social equity component of the legislation. Temporary permits will allow existing medical dispensaries to sell recreational marijuana starting Jan. 5, though these businesses must reapply for permanent permits by April 1. The city will issue licenses for cultivators, infused product manufacturers, retailers, delivery services, testing labs and distributors. No limits on the number of cannabis businesses allowed to operate in the city have been established, though this will be re-examined within one year. • Fresno: With a 4-3 vote, the City Council decided to bar all types of recreational marijuana businesses from operating within city limits. Medical cannabis dispensaries are also banned in Fresno, though some expect the council to revisit the city’s position on MMJ in the coming months. It would be nice to see an article describing how Oakland is handling it. . . Their “Equity” partnership program is quite controversial to say the least. How would you like to give up 50% ownership to a person of color in order to get a business license? Yeah, but equity applicants also get the $2,500 application fee and yearly renewal fees waived. And you wouldn’t be “giving up” anything, you would be acquiring a partner prior to applying, and a partner needs to pull their own weight. It’s not like you already have 100% stake in an existing store and the city suddenly says “hey, you gotta give 50% of it away to a total stranger poc”. No one has to give up 50% of anything to get a license. Everyone is free to retain 100% of their ownership of their enterprise and apply for a license. However, any company applying for a license under the social equity regulations must have, at least in Los Angeles, 51% ownership by whichever principle owner is supposed to qualify for the social equity recognition. This is to prevent the creation of applicants with a figurehead owner of a minimal percentage of a company representing themselves to be social equity applicants. There is no compulsion or obligation to apply for a license in that manner.